Please comply with the forum rules. according to the Server's manual, always start the Server with administrator rights. Its still the same.Any ideas please. The old EFB runs no problem. 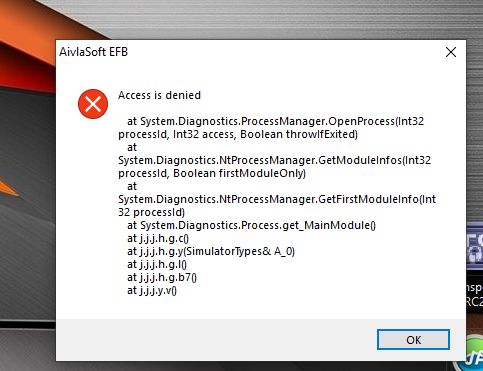 I used EFB2 on Saturday morning , no problem,then this morning i got the error as above. Same issue for me. EFB says "Waiting for server". All was fine an Saturday. Please comply with forum rules! This thread is about Server Error. Your entry is about a Client message "waiting for Server". This is completely different and points to a connection problen of the Client. It if was fine on Saturday then you have changed something in the meantime. Thank you for the guidance. I changed nothing! Please comply with forum rules, espcially items 2) and 3)! Well, the "Waiting for Server" is not even a warning or error message, it is just a system message during startup amd to be more precise - it is a message on the Client. This thead however is about Server Errors of any kind. So, please open a own thread for your problem and supply as much background information as possible. Refer also to the Forum Rules for this.